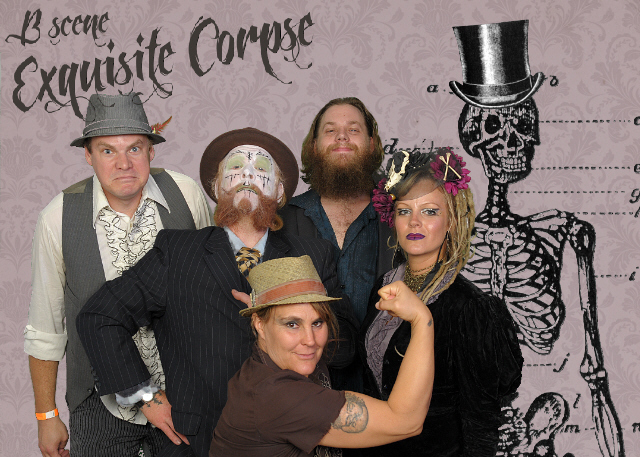 THAT Damned Band at the Blanton Museum’s Exquisite Corpse Party! Tonight in A-TX, @BEERLAND, the Goblinfolk come out! 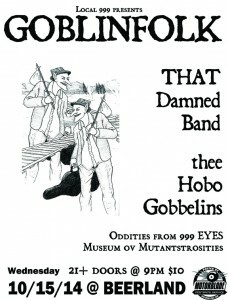 GOBLINFOLK Super Group with both bands. With Professor Plague & Kimball Stone of thee Hobo Gobbelins. THAT Damned Band.com has updated our site with a new lyrics page. More lyrics to come – please email us at thatdamnedband (at) g mail (dot) com for requests, or pm THAT Damned Band on facebook if you have a specific song that is not listed that you would like to see posted. Look to your right to see our new “Lyric of the moment”. Refresh the page in your web browser for a new random lyric. The Black Scorpion takes THAT Damned Band into Ripley’s Beleive it or Not! video for Reality Shock! 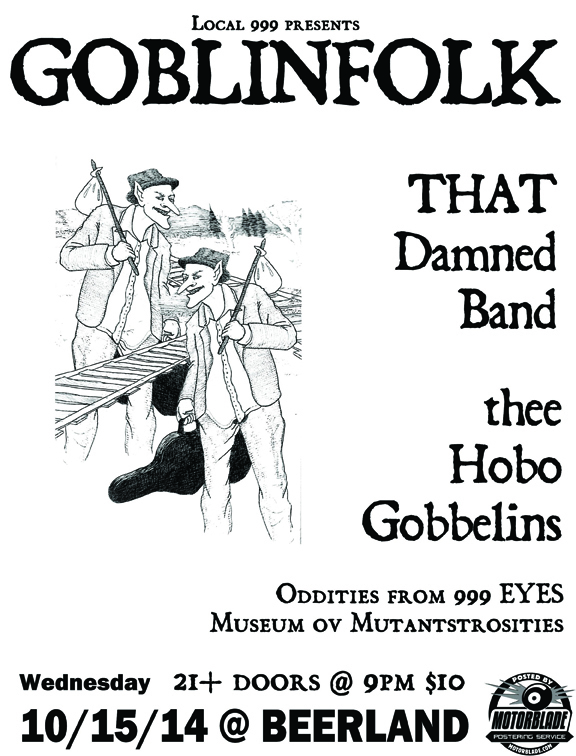 GOBLINFOLK – THAT Damned Band, thee Hobo Gobbelins, + Oddities from (…) at Beerland. Texan native Banjoist, painter, and graphic designer Adam Kobetich (Gatorhorse Studios) has been working closely with Dylan M. Blackthorn for years, designing otherworldly art and logos for THAT Damned Band & the 999 EYES FREAKSHOW & SURREAL SIDESHOW. Adam’s work brings to life the phantasmagoric array of imagery from Dylan’s songs with a 1980’s underground comic book feel, a touch of Geiger(RIP), and with a variety of color mediums. That Damned Band -Mutantstrosities – an album on Flickr. Howdy friends and fans – check it out! 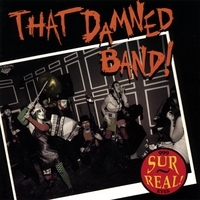 That Damned Band | Mutantstrosities | CD Baby Music Store. 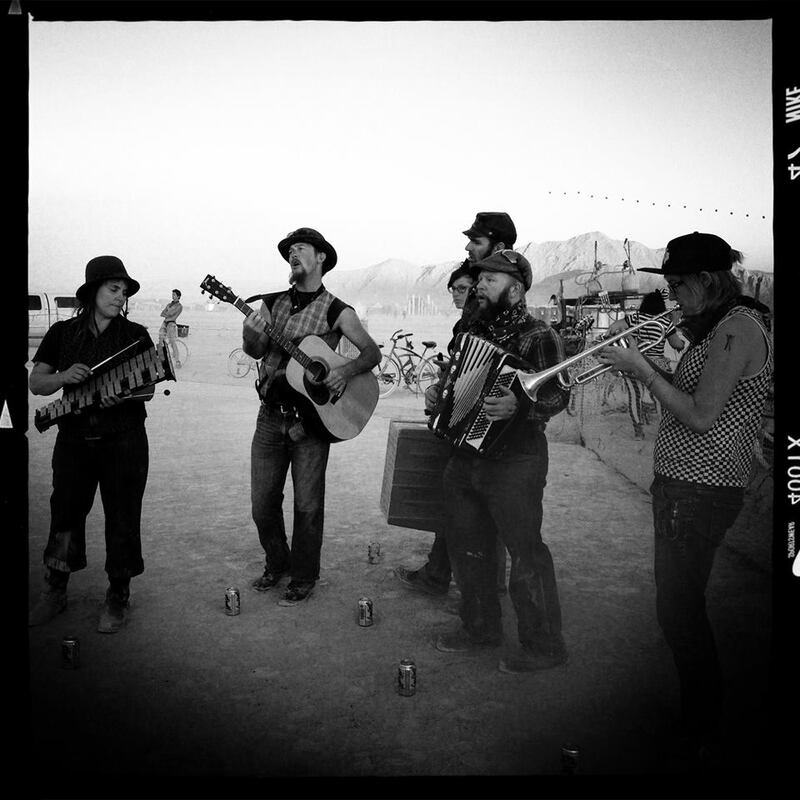 “(That Damned Band) is spectacular if you like accordions and circus music and wash tub basses and saws. 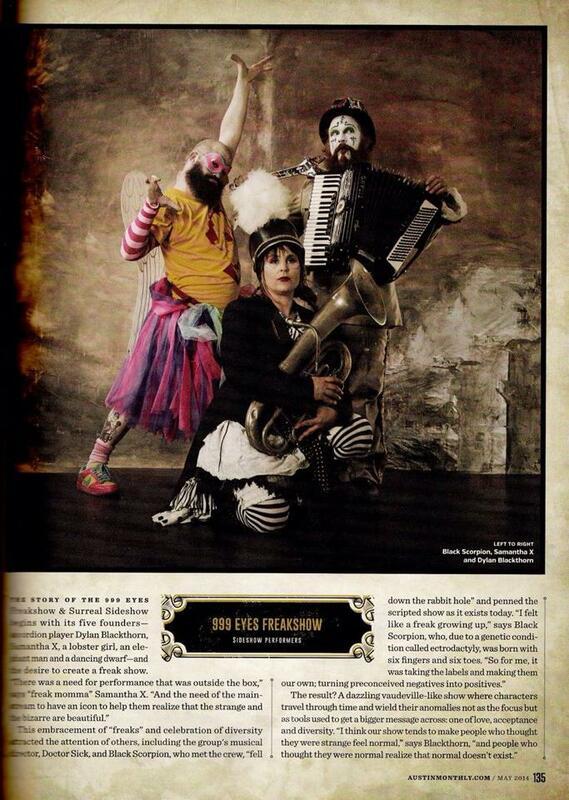 A Blast from the past – Thanks much to sideshowworld.com, a great resource for circus sideshow and freakshow fans. Sideshow World, Sideshow History, Sideshow Memories. SHOWS » THAT Damned Band. 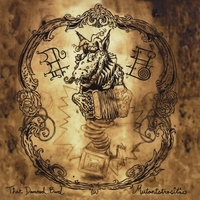 THAT Damned Band’s brand of Steampunk Goblinfolk music is where the Black Sabbaths and Brian Froud meet. Like a black metal cabaret with a little less makeup, accordions instead of electric guitars, and songs from the dark side of the thicket. They are the Boogeyman in the closet, the monster in the well, the necromancer summoning spirits in the graveyard, the troll under the bridge – invoking Datura Whiskey with blood, greenskin and tattered black lace. We at THAT Damned Band would like to extend our utmost thanks to the student union of UNC Charlotte for hosting us (as part of the 999 EYES SURREAL SIDESHOW) at their Student Takeover Carnival! A good time was had by all. 7/20 We are playing this Saturday Night at Strange Brew Lounge on MAN*SHACK 10pm-Midnight. It’s across from ACC by TEX-GUNS. $7 donation. 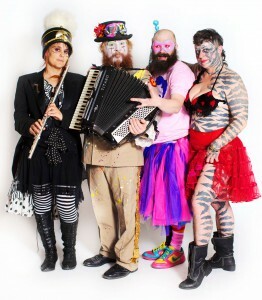 7/22 We be at the SPIDERHOUSE BALLROOM along with the CUTTHROAT FREAKSHOW – as seen on TEEVEE (America’s Got Talent). 11:30PM to 2AM. What else ya gonna do on Monday night?! You ain’t got no job, sheee-it… 2908 Fruth St. Austin, TX 78705. $5 bucks. 7/26 LAST CHANCE! We gonna tear it up at the EASTSIDE SHOWROOM. 1106 e. 6th. 10:30pm-2AM. No Cover. After that, see ya in September. 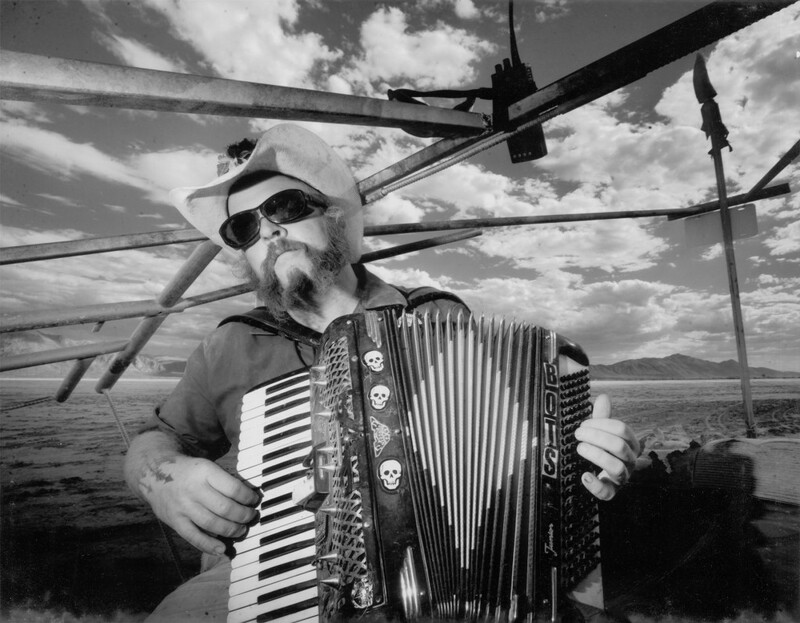 Accordionist Dylan M. Blackthorn will be playing at the San Antonio International Accordion Festival Sunday, September 15th with Mazel Tov Kocktail Hour. Hey Austin, Texans! We are playing this Saturday Night at Strange Brew Lounge on MAN*SHACK 10pm-Midnight. Hope to see you there! Time will stand still this Sunday night when the WORLD’S STRANGEST SHOW, the 999 EYES, plays at Spiderhouse Ballroom. This show will be the pinnacle of this freakshow’s short tour, when the performance will be honed to a razor sharp edge. If you are a fan of Freakshows, Sideshows, or the music of THAT Damned Band, I implore you to attend this assuredly most phenominal performance. 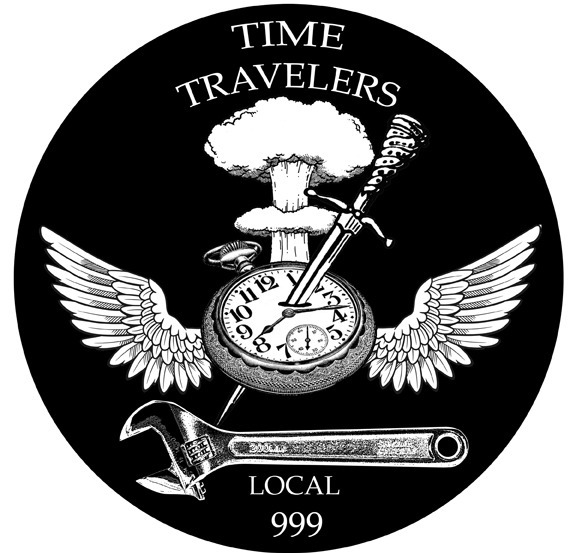 Time Travelers Local 999 Collage by Dylan M. Blackthorn, 2012. Get ready to jump Thursday December 20th, 2012 9pm-2am (if there is a 2 am) Swan Dive, 615 Red River, Austin, Texas.